Today’s chart is free and open to the public. Just as we predicted, Chinese stocks are soaring in 2015. “Put simply, Chinese stocks are long overdue for a rally. And with top financial institutions planning a whole array of new Chinese ETFs, the international demand for Chinese stocks will likely improve in the coming months. That ETF was the Deutsche X-trackers Harvest CSI 300 China A-Shares ETF (Ticker: ASHR). Subscribers who joined me in buying Chinese stocks back in November are now up over 60% — just five months later! Later on Feb 17, three months later after our first buy alert, I told our paid subscribers that I was adding even more shares of ASHR at $36.01. Since then, ASHR has continued to climb higher. 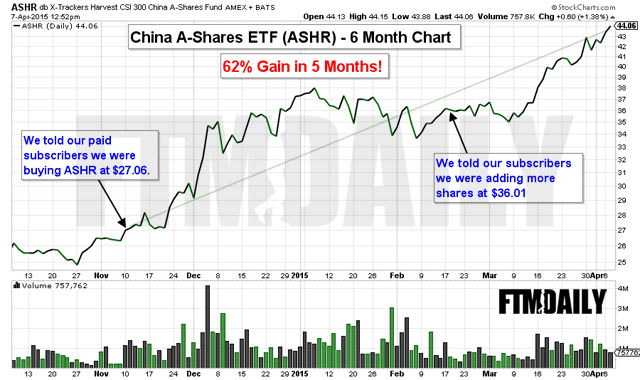 While I am still bullish on Chinese stocks, now is probably not the best time to add shares of ASHR. However, if you want to know when I plan on adding more shares of ASHR, or if you want full access to all of our investing and income ideas, I urge you to consider becoming a member of FTMDaily. Our subscribers know that we consistently offer some of the best investing and income insights available anywhere. Join us today. See our plans and pricing options here. Get Instant Access to FTMDaily's Monthly ETF Trend Alerts! Wise traders and investors know that U.S. stocks are not the only game in town. Each month, our FTM Insiders get access to our powerful trend analysis on 40 global ETFs. Whether you want to invest in Europe, Asia, or Latin America, our ETF Cheat Sheet will keep you on the right side of the market, no matter which global market you want to trade.